Life of a Catholic Librarian: More holiday plans, Catholic Vitamins, and Preparing for Advent! More holiday plans, Catholic Vitamins, and Preparing for Advent! Happy mid-November to all of you! How are those holiday plans coming?! We're getting there, I promise. Let's do a quick round robin of the past week, and then talk Advent planning! Last week we talked a bit about The Nutcracker in it's film adaptation, and although that doesn't replace a live performance, I was thinking about skipping that this year in the interest of time. However, Anne and I agree that it just wouldn't be the same without dressing up for our annual pilgrimage to the Center for the Arts here on campus to see a local production of The Nutcracker. So I'm procuring tickets for us later this week. These are special memories that I hope Anne treasures as much as I do! Every Thanksgiving season, I look forward to the feast of St. Cecilia, and I talk about that for my November offering over at CatholicMom.com. I'd love for you to check it out and comment over there if you also have an interest in, or devotion to, this lovely saint! I think of her so fondly at this time of year. 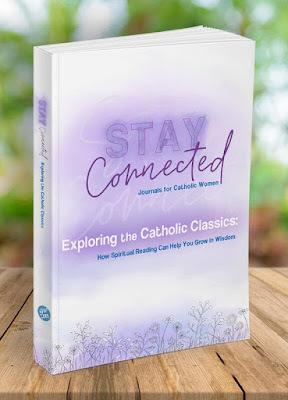 In other Catholic news, I was on the Catholic Vitamins podcast this past week, along with Allison, talking with the positively delightful Deacon Tom Fox about the Stay Connected series of journals. Allison and I each also talk a bit about of faith journeys and some amusing anecdotes along the way. We'd love for you to give it a listen as we approach Advent! Everybody procure their books in the next 1-2 weeks, and we'll start our posts the weeks after Thanksgiving. You can order on Amazon for $14.95 (eligible for Amazon Prime 2-day shipping), or via GraceWatch Media for $11.90 and free shipping with coupon code GRACE15. Posts will be one per week, starting Thursday November 29. There are more chapters than there are weeks we'll be meeting, so what we can do is tackle 2 chapters per week, but let's keep it light. You can work through the journal at your own pace (which is what it's designed for!) but each week I'll post one of the excerpts from each of the 2 chapters, along with one of the reflection questions that speaks to each passage. We can all discuss our answers to the questions. :) Then you can go back to the rest of the content during the week, or another time altogether, your choice. Here's the schedule! I think that this will keep us nice and grounded during Advent for a contemplative and serene experience. 😇 Are you planning other devotional activities for your Advent this year? I'd love to hear about it! I'm always up for another book club after Christmas. Count me in for anything. Melanie, right? Maybe you'll find another Christmas performance to see until they get a new space! Sounds good on the book club!